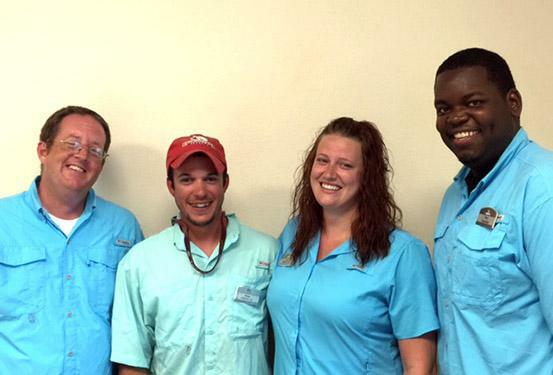 Get ready for a fantastic summer of fun with your HHI Recreation Crew! Starting at the north end of the island our Bluewater Resort and Marina is the perfect place to make a splash, sporting three swimming pools including the lazy river (newly opened last year), a kids splash pad, a fleet of kayaks to cruise along Skull Creek in the Intracoastal Waterway and saltwater fishing directly off our private dock. You can fish and float all you want. Stop by to cool off in our poolside Recreation Cabana where most of our programs take place. You can purchase a drink or snack, and reserve a kayak or a fishing pole. Whether you are interested in arts and crafts or checking out a croquet set, your Recreation Crew is there to make sure you have a great time. On the south end of the island is our Waterside Resort, perfectly located just two blocks from the beach and all the lively fun that our beach community has to offer. Waterside has everything a family needs to make their vacation memorable, from three pool areas, including our children’s pool with its adorable splash fountain, to our secluded lagoon boardwalk with gazebo to view the local birds, wildlife and maybe even an alligator. We have the perfect environment for a diverse recreational experience from arts and crafts poolside, to family entertainment contests and karaoke. We also have informational programs involving our local wildlife, conservation of our precious waterways, and Hilton Head Island’s incredible and diverse history dating back to the prehistoric mysterious shell rings. The Recreation department of Hilton Head Island is committed to bringing our Spinnaker families and their guests happy vacation memories to last a lifetime. Whether it is reeling in your biggest catch on our dock, kayaking alongside a pod of dolphins, executing a grand prize belly flop, or enjoying a yummy frozen concoction by the pool, your Recreation Crew is here to chart the course for your “Smooth Sailing” vacation experience. This summer at Waterside Activities department we’re bringing back the “5 O’Clock Somewhere” party. Come join Eric for a fun relaxing Piña colada or Strawberry Daiquiri party. This “Five O’Clock Somewhere” party will be held for the whole family to come enjoy the fun. There is no cost to attend so there is no reason not to have some fun. This party is a great place to mingle and meet other guests and owners. ARE YOU READY TO SING YOUR HEARTS OUT? Well, LIP SYNC & PERFORM YOUR HEARTS OUT? This summer, we’ll be introducing a new event for our guests of ALL AGES! This event will take place poolside at Waterside’s main pool (beside the Activities and Registration Building). Our guests will have a mic and pick any song of their choice to challenge their fellow contemporaries in a fun-filled lip sync battle on the pool deck. Our lip sync battle fans (non-participants) play an important role as they will be our judges by crowd noise levels (cheering, clapping, etc). The winner of the lip sync battle will receive a prize and bragging rights for their top-notch performance. We’re excited about bringing this new event to Waterside Resort. We look forward to having everybody join us this summer! This summer I am really looking forward to starting a new event for kids AND parents. I am very pleased to be starting a Kids Night Out. We’ll be holding this event at the Bluewater Resort in the activities building. Kids Night Out will include but not limited to pool games, board games, movies, popcorn, pizza, prizes, crafts, and tons of FUN. This activity is not only for the kids but also for the parents to be able to have time for YOU. I am really looking forward to making great and lasting memories with your children. This will be a great event for kids to make new friends and have many things to talk about when they get back home. Don’t miss out on signing your children up, can’t wait to meet all the smiling faces! Fishing is a sport anyone can enjoy and our fishing guy Dan is looking forward to assisting our guests and owners learn new fishing and crabbing techniques or introduce them to saltwater fishing for the first time. Dan grew up fishing in the Lowcountry waterways and is one of only a few South Carolina DNR certified fishing instructors on Hilton Head Island. He strives to help out anyone who wants to learn and loves seeing the joy of kids and adults alike reeling in their first saltwater fish. Don’t miss Dan’s Monday morning Fishing Report at Bluewater, where you will hear the week’s projected weather conditions, what is biting and what bait is currently getting the most action, then look for his programs throughout the week on the Bluewater fishing dock.